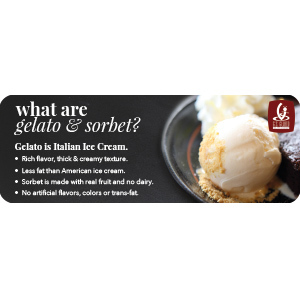 Show off your delicious soft serve gelato, sorbet and frozen yogurt with this vibrant, eye-catching poster! Available in 3 stock sizes (11″x17″, 18″x24″, and 24″x36″). Choose from a hardcopy poster for shipment, or download a digital file to take with you to your favorite print shop (download link provided after checkout).